On Saturday I headed into Colchester town to take part in the The Hazel Gallery Spring Arts Fair at The Waiting Room in St Boltolph's. I'd like to say thank you to Lucy Hook-Child who organised the day and bought together a lovely selection of makers selling their handmade work. Despite the soggy weather early on it was a great day with live bands creating a really upbeat atmosphere. One of my favourite stands was Comics and Cogs, who are makers after my own heart, creating jewellery and accessories from items such as watch parts, old comics and damaged books (such a clever idea). Check out their Facebook page here and have a look at the photos of the beautiful things they make. A piece from them is definitely on my wishlist! Here's a little look at what a friend and I got up to this afternoon at our first embroidery class! We're both keen to master the basic stitches, so we went along and today and our lovely tutor taught us how to make French Knots! I would like to include some hand embroidery in my new project so I'm really excited to have the chance to learn new techniques. We started by transferring a floral design onto calico, and then we started to fill in the image using the French Knots. Tea, biscuits, good company and stitching! Our homework is to fill in the rest of the flower buds with French knots. We're going back for another lesson in a couple of weeks when we will learn more stitches to complete the stems and leaves and I'm looking forward to another therapeutic afternoon! I'll keep you posted on our progress- I'm off to stitch French Knots onto everything to practice! I've been experimenting with learning Fair Isle knitting recently and I've decided that I'd like to have this as a Winter project. In the meantime, I wanted to make some bright and summery textile jewellery, so here's a sneak peak at what I'll be working on this week! I've been gathering off-cuts of Liberty print fabrics from Ebay (this is a new brightly coloured batch, I love them! ), as well as hand embroidered tray cloths, and I'd like to combine these with lace and other up-cycled materials. I also wanted to add some extra colour and I'm excited to have discovered these Permaset Eco Friendly screen printing inks. Looking forward to getting to grips with these- I've just started making some handmade stamps using wood blocks and fun foam (more on this later in the week). I'm also going to an embroidery class later this week as I'd like to include some hand embroidery. It's going to be a busy week! 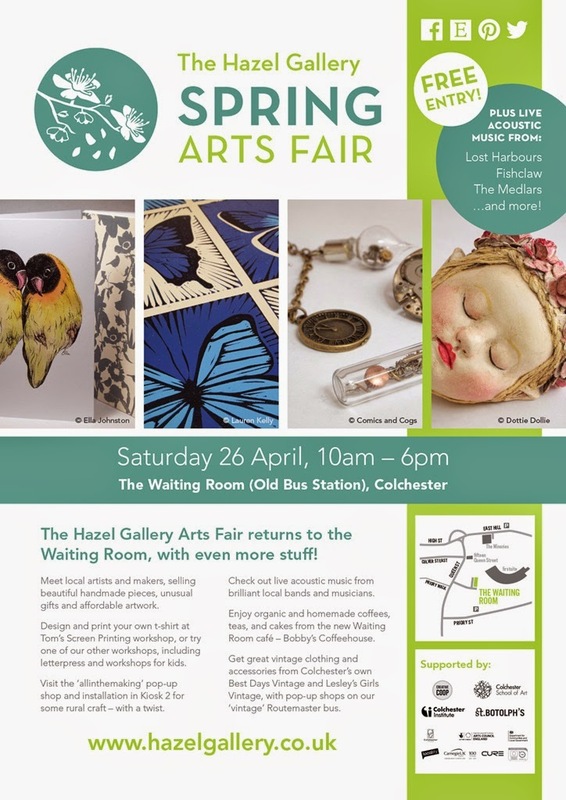 On Saturday 26th April I will be taking part in The Hazel Gallery Spring Arts Fair, at The Waiting Room, Colchester. There will be lots of stall holders selling original handmade pieces, gifts and artwork, as well as live music, workshops, tea and cake (!) and vintage pop-up-shops on board a Routemaster bus! Well worth a trip! Come and say hello, I'll be having a sample sale of pieces from my new Spring collection, as well as showcasing some new knitted rings and brooches in Spring colours. Hope to see you there! By way of a very big thank you for reading my Blog, you can now get 20% off all purchases in my Etsy shop until 5th May- Just enter the code Thankyou20 at the checkout and treat yourself or a loved one to some unique handmade jewellery and accessories!